As the owner of Fox Broadcasting we’re guessing that Rupert Murdoch loves (ok, tolerates?) The Simpsons. Hell, who doesn’t love The Simpsons? Them and their crazy yellow non-aging antics. 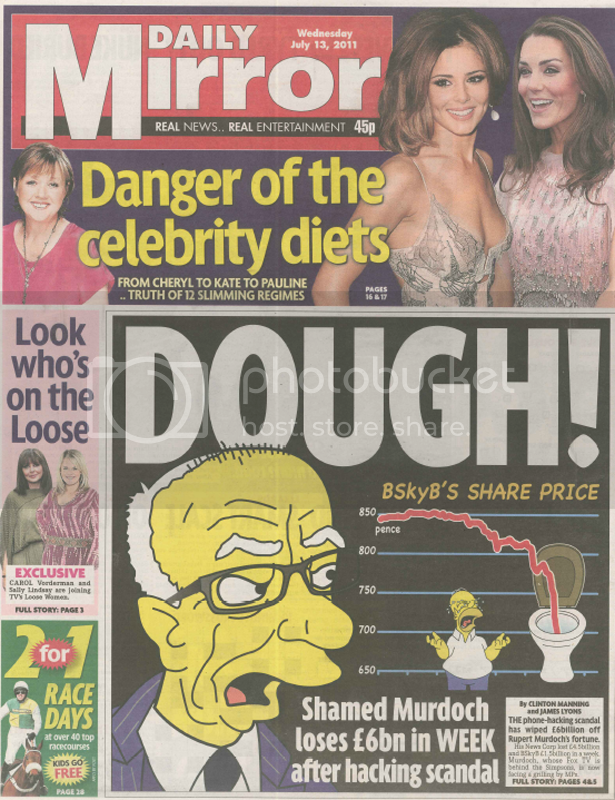 However, we’re guessing that the troubled media mogul isn’t smiling at being given The Simpsons treatment by the Daily Mirror this morning (see the front page below). Highlighting how the recent phone hacking scandal has wiped £6billion off his empire, Rupert looks on aghast as BSkyB’s share price goes down the swanny. Meanwhile, all Homer can do is sob uncontrollably. Dough indeed.